State Sen. Missy Irvin of Mountain View gives a thumbs up after announcing legislative support for the UAMS Cancer Institute’s quest to achieve NCI Designation. She is joined by fellow members of the Republican Women’s Legislative Caucus, including co-lead sponsor Rep. Michelle Gray (in red jacket). 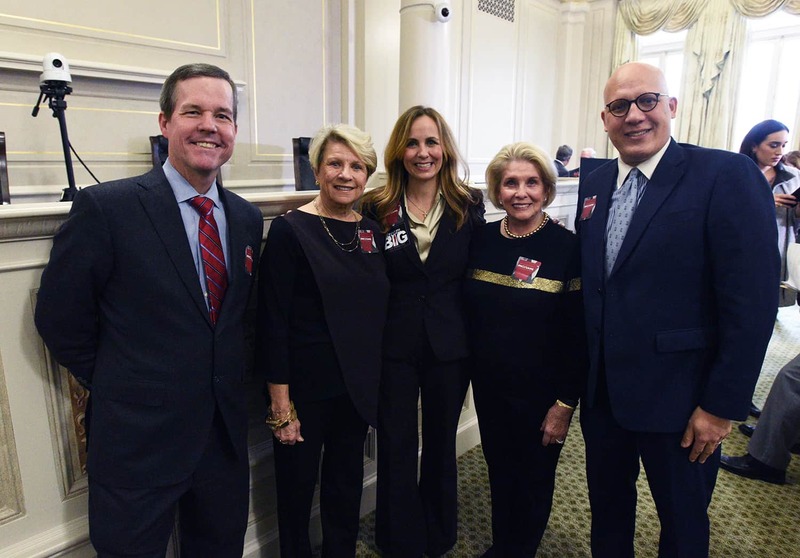 A group of Arkansas legislators proclaimed their support of a UAMS initiative to expand its cancer research and treatment efforts during a Jan. 23 event at the state Capitol. Lead sponsors Sen. Missy Irvin of Mountain View and Rep. Michelle Gray of Melbourne joined with fellow members of the Republican Women’s Legislative Caucus to name the UAMS Winthrop P. Rockefeller Cancer Institute’s quest to achieve designation by the National Cancer Institute (NCI) as one of the priorities in their Dream Big for Arkansas Initiative. At the state Capitol to support UAMS’ efforts to achieve National Cancer Institute Designation were (from left) Chancellor Cam Patterson; Stuart Cobb; Sen. Missy Irvin; Barbara Hoover; and Hatim Smouni. “Cancer knows no bounds and has likely affected everyone in this room today. That’s why we vow to work with all legislators and community leaders to identify sustainable funding sources and make this designation possible for all Arkansans,” Irvin said to the crowd gathered for the announcement. Those in attendance included UAMS Chancellor Cam Patterson, M.D., MBA; Cancer Institute Interim Director Laura Hutchins, M.D. ; former Arkansas Gov. 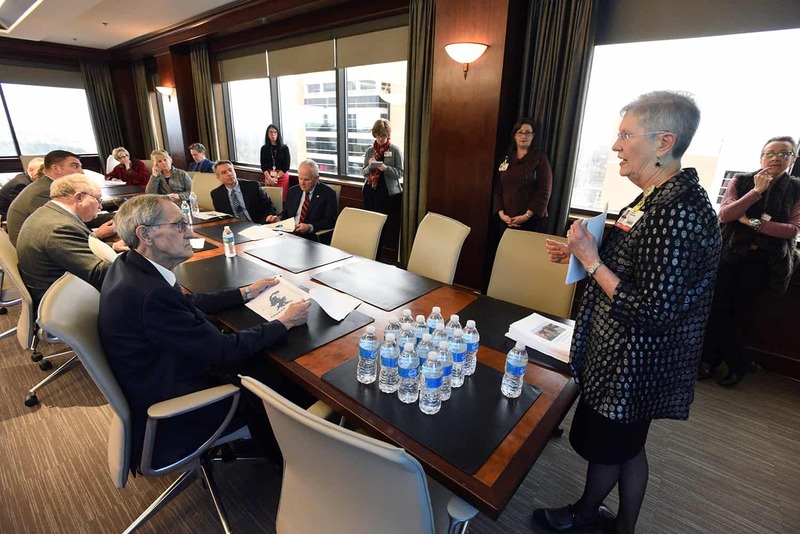 Jim Guy Tucker; constitutional officers and fellow legislators; members of the Cancer Institute board of directors and University of Arkansas board of trustees; and other UAMS supporters. NCI Designation is awarded through a highly competitive assessment process during which cancer centers must demonstrate outstanding depth and breadth of high-quality cancer research, including basic laboratory, patient/clinical and population-based research. There are 70 NCI-designated cancer centers in 36 states across the country, with the closest to Arkansas being in Memphis (pediatrics only), Dallas and Oklahoma City. Achieving NCI Designation would provide many tangible benefits, including improved access to clinical trials and new therapies unavailable elsewhere in the state; greatly increased access to federal research grant awards; and the creation of more than 1,500 new jobs over five years. “Not only would NCI Designation increase the ability of Arkansans to receive the most up-to-date cancer treatment, it also would provide an estimated $70 million economic benefit to the state annually,” Irvin said, citing an economic impact assessment conducted by the Arkansas Center for Health Improvement. UAMS Chancellor Cam Patterson, M.D., MBA welcomes members of the Arkansas Legislature’s Public Health, Welfare and Labor Committee for a tour of the campus. In addition to the caucus’ support of NCI designation, they announced four other areas of focus: juvenile justice, child care, education and economic development. 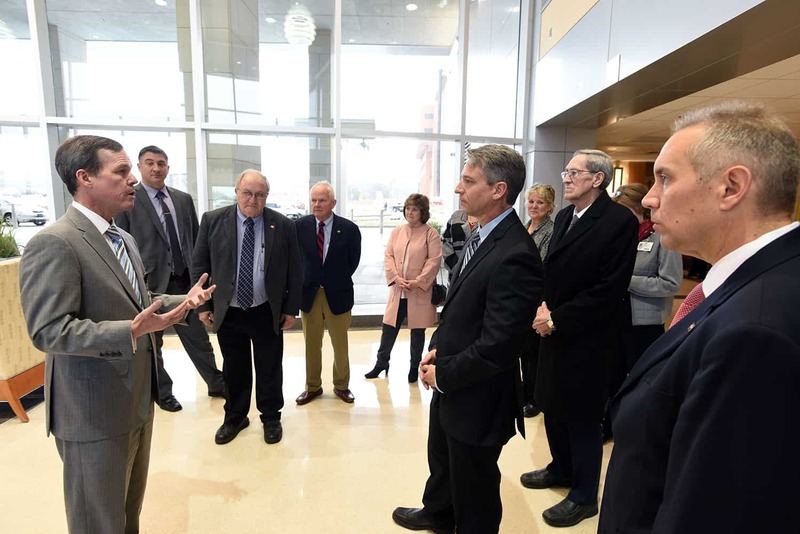 One day before the caucus’ announcement, members of the Arkansas Legislature’s Public Health, Welfare and Labor Committee gathered at UAMS for a tour of the Cancer Institute and several other key areas on campus. Rep. Jack Ladyman of Jonesboro, chair of the committee, said the tour was an essential element to his committee’s understanding of the health care needs of Arkansans. “With some health care-related bills expected to come before us during this session, we want to be as educated as possible in this important area,” Ladyman said. The tour began with a welcome by Patterson, who expressed thanks to the committee members for their service to the state and their interest in UAMS. “We hope that Arkansans who are sick benefit from the services we provide and those who are well sleep better knowing we are here when they need us. None of this would be possible without the ongoing support of the state,” Patterson said. In the emergency department, tour participants were introduced to Ron Robertson, M.D., director of trauma, who discussed the complex process of treating patients with traumatic injury. UAMS Medical Center is the only adult trauma center in the state designated as Level 1, which indicates its capability to provide the highest level of trauma services. Laura Hutchins, M.D., interim director of the UAMS Winthrop P. Rockefeller Cancer Institute, shares with Arkansas legislators the benefits of achieving NCI Designation. “We average about eight trauma patients each day, most of whom are critically injured,” Robertson said, adding that patients are regularly transferred to UAMS from every county in Arkansas. From the emergency department, the group visited the Cancer Institute where Hutchins discussed the ongoing efforts toward achieving NCI Designation. Two researchers shared their work in the development of a liquid biopsy for lung cancer and in proteomics, which is the study of proteins and their role in the development and treatment of cancer. Additional stops on the tour included two simulation centers: one serving future eye surgeons and one benefiting students and employees from several UAMS colleges and departments. In the Harvey and Bernice Jones Eye Institute, committee members were greeted by Christopher Westfall, M.D., professor of ophthalmology and dean of the UAMS College of Medicine, who explained the complex process of becoming an eye surgeon and welcomed them into the simulation center where future surgeons practice techniques on silicon or donor eyes for a minimum of 120 hours before operating on real patients. On the tour’s final stop, Mary Cantrell, executive director of the Centers for Simulation Education, demonstrated how UAMS students, practicing physicians, nurses, first responders and other staff members improve their ability to practice safe, high-quality health care through the use of simulation activities. Using the center’s high-tech, lifelike manikins, students and health care professionals can practice procedures such as endoscopy, ultrasound, childbirth and central line placement prior to serving actual patients. Rep. Lee Johnson of Greenwood, an alum of the UAMS College of Medicine, expressed his thanks for the chance to revisit his alma mater and witness the advances that have taken place since he graduated in 1996. “As Arkansas’ only academic medical center, UAMS is the pinnacle that drives health care for the rest of the state. Just because I am a doctor, it doesn’t mean I know everything there is to know about public health, so I was glad to return to UAMS and see the fantastic advances that have taken place in health care and education,” Johnson said.